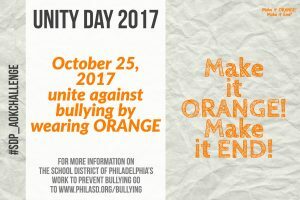 In celebration of Bullying Prevention Month, the School District of Philadelphia encourages all District employees to wear ORANGE on October 25th. Unite together against bullying by making it ORANGE and making it end! Help us send a message that we will stand together united for kindness, acceptance and inclusion in our schools and communities. 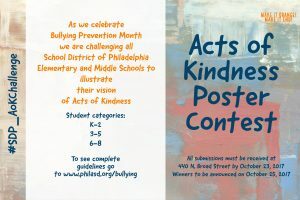 Acts of Kindness (AoK) Poster Competition: The poster contest is open to all School District of Philadelphia Elementary and Middle schools. We encourage each school to create a poster that represents the theme of Acts of Kindness for submission. Schools interested in participating can enter by submitting posters for one of the following grade divisions K-2; 3-5; 6-8. Poster submissions must meet the following specifications: Posters must be submitted on a single flat display board (no tri-folds will be allowed). Maximum dimensions for posters are 24×36 inches. Any lightweight paper should be mounted on tag board. Wood, plastic, glass, metal, fabric and felt SHOULD NOT be used to create the poster. The school, grade division, and students names or homeroom teacher should appear on a separate piece of paper attached to the back of the poster. The poster CANNOT include any copyrighted characters, such as those from comics, cartoons, television programs, newspapers, magazines, etc. and MUST BE 100% student produced. Posters must be dropped off at 440 N. Broad Street, Suite 243 by October 23, 2017. All posters will be hung in the Atrium of the Education Center beginning October 23, 2017 to be independently judged using the following criteria: Creativity, Originality, Quality, Positive message, and Incorporating the theme Acts of Kindness with bullying prevention. One 1st place winner will be chosen from each grade division. Winners will receive a trophy, a banner to display in their schools as well as coveted bragging rights. Winners will be announced on October 25 at the Make it Orange! Make it End! Unity Day Event. Images of the winning posters will be displayed on PSTV as well as our District website. Social Media Challenge: Would your students like to win FREE tickets to Powerhouse?…ARE THEY READY FOR THE CHALLENGE?… #SDP_AoKChallenge. Be sure their account is public until the winner is announced on October 25, 2017 at 3p.m. 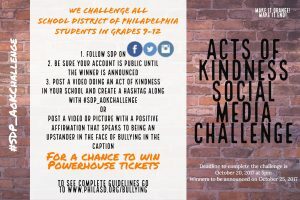 Post a video of themselves doing an act of kindness in their school and create a hashtag along with #SDP_AoKChallenge OR Post a video or picture with a positive affirmation that speaks to being an upstander in the face of bullying in the caption. All posts must be 100% student produced. Deadline to complete the challenge is October 20, 2017 at 5:00 pm Eastern time. Posts will be judged on the following criteria: Creativity, Originality, Clarity of expression, Strong adherence to theme and Potential for impact on school climate. Winners will be announced via social media on October 25, 2017 by 3p.m.